Our centre is located in the heart of Portsmouth, it consists of a warm indoor classroom (not just a storage container) with hot and cold refreshments, and two large approved training sites used for both CBT and direct access motorcycle training. Our comprehensive motorcycle training programs are designed with the customer in mind and are tailored to your own personal requirements. 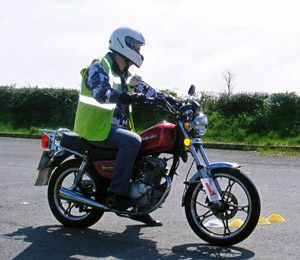 Our motorcycle training centre is well staffed and very close to a main train station and motorway. We have a full fleet of training bikes for CBT and motorcycle test training. This means we are able to serve Portsmouth, Fareham, Gosport, Havant, Waterlooville and Hayling Island with CBT and full license training. Please browse our site using the links at the top for more information.